One in five people in the UK suffer from stress at some point according to the Health & Safety Executive. According to the NHS one in every five visits to GPs relate to mental health issues including stress, depression and anxiety. Stress is thought to be one of the biggest killers in the developed world, with cardiovascular disease and other conditions thought to be triggered by stress. If stress doesn’t kill you, it can still impede your ability to make decisions, to concentrate and to communicate effectively. 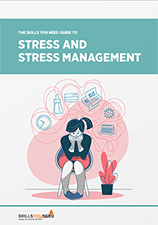 Employers in the UK are legally required to protect the welfare of their employees, which includes stress, but this article contains some advice on how to manage work stress yourself. If your job is demanding and difficult some stress can be expected. Small amounts of pressure can be stimulating, but when this pressure is excessive and it begins to detrimentally impact you it has become workplace stress. Common causes of workplace stress include communication problems or a bad working environment, but it can also be triggered by outside events including the breakdown of a relationship, bereavement, financial problems and sickness. It’s natural to feel motivated when at work, but it’s important to identify stress when it starts to impede on your work. It can be a good idea to record the different types of symptoms you experience. This can include physiological symptoms, such as an accelerating heart rate and tightening muscles, emotional symptoms such as anger, agitation or trouble focusing and behavioural problems such as having problems sleeping and overeating. Sometimes it can be hard to identify these symptoms until stress has taken hold. If the demands of your job are taking their toll on your physical and mental health then the first thing you should do is talk to your employer about the problem. Employers are duty-bound to protect your health and wellbeing, and should work with you to minimise workplace stress. The first thing you should consider is booking any owed holiday, and secondly discuss reducing contracted hours if possible. Take more breaks at work and ensure that you make the effort to enjoy your lunch break - nobody should be working flat-out all day. Discuss your work roles and responsibilities with your employer or line manager; explain the adverse reactions you are experiencing and work towards reducing your stress levels through re-assigning work, roles and responsibilities. If time management causes many of these negative emotions then perhaps some forward-planning could help you feel more relaxed and confident moving forward. Although work might be the root problem of stress, making other small changes can also benefit your wellbeing. The importance of sleep is often underestimated, with many of us choosing to burn the candle at both ends to get a bit more done in a day. It’s easy to understate the importance of sleep, but getting at least seven hours per night helps to relieve stress and promotes a health. If you’re having trouble sleeping it may be worth looking at diet, exercise and lifestyle before turning to your doctor for medication or professional advice if the situation does not improve. Exercise is a great way to “burn off” negative emotions, relieve muscle tension and generate endorphins which make you feel good. Many people who exercise regularly say that it acts as a form of therapy. For the best results you should integrate exercise into your daily routine so it becomes natural. If you are unfit you may want to start with gentle exercise such as walking. Not eating properly, or consuming too much of certain substances such as caffeine can also contribute to stress levels. Complex carbohydrates such as potatoes, pasta and whole grain bread are known to calm people down, making them a good choice for breakfast or dinner. Monitor your caffeine intake and consider replacing traditional tea or coffee with calming natural herbal teas. It’s important to take work seriously, but when the stress of work impacts on your personal wellbeing it’s clearly time to re-think things. Learning to laugh, to smile and let go is easier said than done, but sometimes it really can be the best medicine. Mental health conditions become disabilities if they have a long-term impact on an individual’s day-to-day activities. Long term is defined in the Equality Act 2010 as lasting twelve months or more. If a mental health condition turns into a disability, individuals are entitled to support from their employer, who cannot discriminate against individuals because of a disability. The employer is required to make ‘reasonable adjustments’ to working conditions to ensure that individuals suffering with disabilities are not disadvantaged compared to other employees. This could typically include more flexible working conditions, time off for medical treatment or personal counselling and providing technical aids and equipment. Alan Cairns writes on a range of subjects including mental health and human resources on behalf of Clinical Partners. The new 'Addiction and Mental Health in the Workplace' interactive infographic published by Clinical Partners aims to help managers and individuals to understand the prevalence of mental health issues in the UK and the likelihood of encountering them in the workplace.